SOIL GROWERS' FAVORITE This 5 gallon equivalent Air-Pot is excellent for transplanting seedlings and cuttings from smaller containers. Plants can be kept for one to two seasons before transplanting into a larger pot, or directly in the garden. This pot will accommodate a 2' to 6' plant. It is also possible to continue growing in this pot past the second season, just keep watering and fertilizing as required. The root system will continue to flourish and will produce abundant foliage. 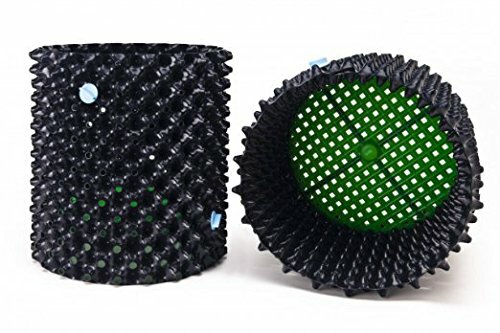 Actual size: 3.6 gallons or 13.8 liters Dimensions: 12.4"H x 11.5" Outside Diameter (10" base) - 5 gallon equivalent - green colored base The SuperootsAir-Potis a recyclable, reusable plastic container that actively enhances the quality of the root systems of plants. This revolutionary approach to containerizing plants and trees produces fabulous, non-spiraling root systems that are impossible to develop in any other available container. Made of recycled HDPE in the UK, the Superoots Air-Pot is circular in shape with a perforated sidewall. There are no flat surfaces due to the inward and outward pointed cones, which eliminates any chance of starting the spiraling process as well as dramatically increases growth rates. Air-Pot benefits: - Eliminates root circling - Reduces growing time in the garden - Increases yields - Simplifies production - Minimizes the need to transplant - Ensures superior performance in extremes of weather - The Air-Pot is made of recycled HDPE plastic - Reduces the chance for overwatering.